Corn is at peak season here. A local favorite is Silver Queen. It's a sweet white corn. If you can find that type, give it a try. Most any of the yellow or sweet yellow corn in the grocery are fine for eating. You'll find more varieties if you hit a farmer's market. One of our favorite ways to serve fresh corn (besides boiling it up in a pot) is to toss it on the grill. There are two methods to Grill Corn on the Cob. I cover the basics at Yes You Can Grill where I work on the Barbeque Master space. 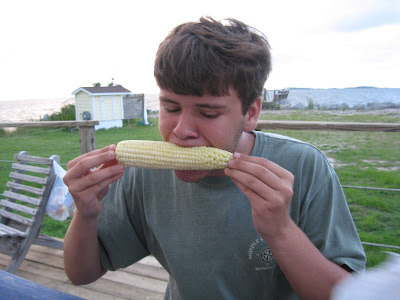 My tips will have you turning out perfect grilled corn every time.